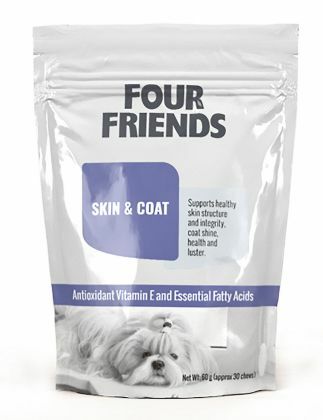 FourFriends Skin & Coat contains important nutrients that strengthen the skin's barrier and contribute to a glossy and easy care coat. The skin's natural protective layers are enhanced by the omega fatty acids, especially when omega-6 nourishes the skin. Skin and Coat is full of antioxidants, especially Vitamin E which is a very powerful antioxidant for the skin. Chicken liver, oatmeal, dried brewer's yeast, glycerin, gum arabic, safflower oil, vitamin E, water, fish oil, ascorbic acid, propionic acid, mixed natural tocopherols.